Here’s one story: September 11, 2001, terrorists from al-Qaeda who hated the American way of life hijacked four passenger airlines and drove them into buildings in a coordinated attack against America and all it stands for. In response, America launches a war against these terrorists as a way to protect our homeland. Here is another story, less often told: Following decades of US terror campaigns in the Middle East – campaigns that led to the decaying of infrastructure, health care, education, and the economy in multiple countries abroad – terrorists groups, many who had been armed and trained by the United States CIA, turned against the US. On September 11, 2001, al-Qaeda, led by Osama bin Laden (who had been trained by the CIA to fight the Soviets) carried out a coordinated attack against the United States. Since that time, the United States has doubled its efforts to intervene in the Middle East, reigning terror on Iraq, Afghanistan, Pakistan, Yemen, and now Syria, as well as in parts of Africa – Libya, Somalia, and Djibouti, for starters. Here’s a parallel story, given even less attention (credit to Reprieve UK): Abu Wa’el Dhiab was born in Lebanon but lived in Syria with his family from an early age. In 2000, he got married, started a family, and began running a successful business in Afghanistan. After the September 11th attacks, Mr. Dhiab and his family were forced to flee Kabul, as the city was no longer safe for them. Just months after fleeing, he was arrested by Pakistani police. While he was charged with no crime, he was turned over to the United States (likely for a large bounty). From there, he was flown to Bagram Airbase in Afghanistan in June of 2002 and shortly thereafter to Guantanamo Bay. To this day – having been charged with no crime, having had no trial – Mr. Dhiab remains in Guantanamo Prison. Detained Indefinitely. Tortured. Deprived of his family for over a decade. Unable to provide for his wife and children. Unable to watch his children grow up. Unable to hold his wife. Unable to be heard. What’s more, Mr. Dhiab has been cleared for release since 2009 – five years ago. I’ll let that sink in for a moment as you imagine what your life would be like if you’d missed out on the last 12 years – the monotony of solitary confinement broken up only by interrogations and torture. Now imagine that you can’t even protest your 12 year detention. Mr. Dhiab has taken part in hunger strikes at Guantanamo for seven years of his detention, part of the mass hunger strikes that have rippled through the prison since 2005. 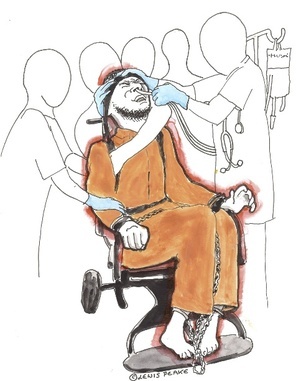 During the peak of the strikes in 2013, an estimated 166 detainees were on hunger strike. In response, the US military began force-feeding the strikers. Now, Mr. Dhiab is challenging the force feedings, calling it a method of punishment, not a medical procedure as the government claims. This is the parallel story that is the horrific and terrible truth for over 140 detainees currently being held at Guantanamo, not to mention the countless other victims of US imperialism being held in black site secret prisons around the globe. Afterward, the tube is quickly ripped out, often causing trauma to the nasal passages, and the prisoner is watched for at least 45 minutes, to ensure that they do not vomit or try to induce vomiting. If they do, the procedure is done again. The prisoners are also given Reglan, most likely without the prisoner’s consent. Reglan is an anti-nausea drug, which if administered for long periods of time, is known to cause an irreversible neurological disorder called tardive dyskinesia, which causes twitching and uncontrollable movements. Some prisoners have been force-fed thousands of times over a period of years. During Mr. Dhiab’s court case, Steven Miles, a doctor and medical ethics professor at the University of Minnesota, told the court that olive oil had been used as a lubricant for the feeding tubes. He called this method “astonishing” since this is known to cause chronic inflammatory pneumonia. Interesting, since the government claim as to why they were force-feeding the prisoners was in order to keep them alive and safe, a difficult thing to do when you’re administering drugs known to cause irreversible neurological disorders and using methods known to cause pneumonia. Of course, the entire premise is flawed, since looking out for someone’s safety must certainly include not locking them up in a prison indefinitely, without evidence presented against them, without trial, and without a means of even challenging this practice, all the while subjecting them to torture day in and day out. So here we have it: The United States has been waging illegal wars of terror around the globe for decades – following a pattern of arming rebel groups and later fighting against them. Sometimes on suspicion of terrorist ties, sometimes on no information at all, the US government pays thug-leaders in nations like Pakistan to hand over people who are then flown to secret detention centers around the globe, some ending at Guantanamo Prison. These men – held indefinitely, many for over a decade – are never charged with crimes, nor are they given a day in court. Many of these men the United States admits are no threat to our national security and have no ties to terrorist organizations. Despite that, they are tortured time and again. If they try to raise their heads – try to use what little autonomy they have in these US concentration camps – by protesting the very nourishment that keeps them alive, they are tortured still more – forcibly fed and silenced. This is what the United States is – the greatest purveyor of violence and suppression around the globe and at any point in history. God Bless America. Tags: 9/11, Abu Wa'el Dhiab, Afghanistan, detainees, enhanced interrogations, force-feeding, Guantánamo Bay Prison, Hunger Strikes, Indefinite detention, International Red Cross, Kabul, Lebanon, olive oil, Pakistan, President Obama, protest, rendition, September 11, solitary confinement, Syria, torture, United Nations, US military, water-boarding, World Medical Assoication. Bookmark the permalink.